Bitcoin reached an all-time high of $19,783.06 on December 17, 2017. Since then, the cryptocurrency has lost over 66% of its value. When’s the last time the U.S. dollar has done that? Answer: Never. Bitcoin is a lot more like the Turkish lira, at least in terms of its performance, than the greenback or real money (gold and silver). But try telling a bitcoiner that back during the heights of cryptomania. These folks took irrational exuberance to an entirely new level, investing good money into an unbacked and untested computer currency that almost immediately lost 2/3 of its value. Straight up burning cash would have at least provided some heat. Bitcoin’s demise was easy to predict. Indeed, I called the crypto’s top on December 7, just ten days before the market officially peaked. As it turns out, bitcoin didn’t fall below $10,000 before the end of 2017 (as I predicted it would), but it was trading sub-$7k by April 1, 2018. As of this writing, a single bitcoin would set you back $6,724 if you were foolish enough to buy one. Could bitcoin fall another 85% by the end of the year? Yes, I think it could. But I didn’t only give price targets for bitcoin when I was posting my predictions in late 2017. I also came out bullish on the U.S. dollar, Apple shares, and gold bullion. So far, the U.S. dollar has utterly crushed bitcoin, even if its gains have been rather meager. The PowerShares DB US Dollar Index Bullish ETF (ticker: UUP), which tracks the dollar vs. a basket of other fiat currencies, most recently closed at $25.20; up just 3.4% since December 7, but that’s a lot better than the -66% return posted by bitcoin over that same time. Seriously: Bitcoiners will tell you that crypto is a safer alternative to the U.S. dollar. The Federal Reserve’s manipulations definitely debase the dollar, but the U.S. currency is obviously much stabler than “decentralized” bitcoin, despite the Fed’s machinations. Next, I said shares of Apple Computer would outperform the U.S. dollar. Boy, have they. 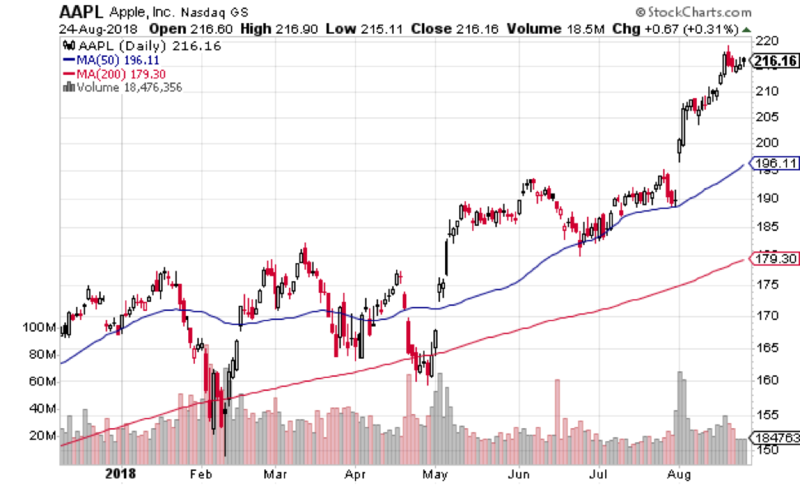 Shares of Apple closed at $167.40 (adjusted for dividends) on December 7. Since then, they’ve gained more than 29%, most recently closing at $216.16. Back in late 2015, I gave my daughter her choice of two investment-related Christmas presents: A 1/10 ounce gold coin or a share of Apple. She chose Apple, and she chose right. My daughter’s investment account is 100% Apple. We’ve made three purchases on her behalf – on 12/29/15, 4/27/16, and 12/29/17 – and we’ve reinvested all dividends. She’s up 85%, and she has made her gains by investing in what is quite possibly the bluest blue-chip stock in history. I’ve been an Apple bull since 2013. It’s been the only stock to buy, really, given its combination of high growth, low valuation, and immense hoard of cash. Back on December 7, 2017, my investments in Apple were up 70%. I made a Facebook post touting the combination of performance and safety, to which one of my bitcoiner friends said he’d “rather have an unsafe +3,000%” than a safe +70%. Sure, but how does bitcoin’s 66% loss in less than nine months feel? Not too good, I imagine. I was dead wrong in one aspect of my prediction, though: Gold prices have not rallied. Gold closed at $1,255 per troy ounce on December 7, 2017, and it has actually lost 3.7% since. 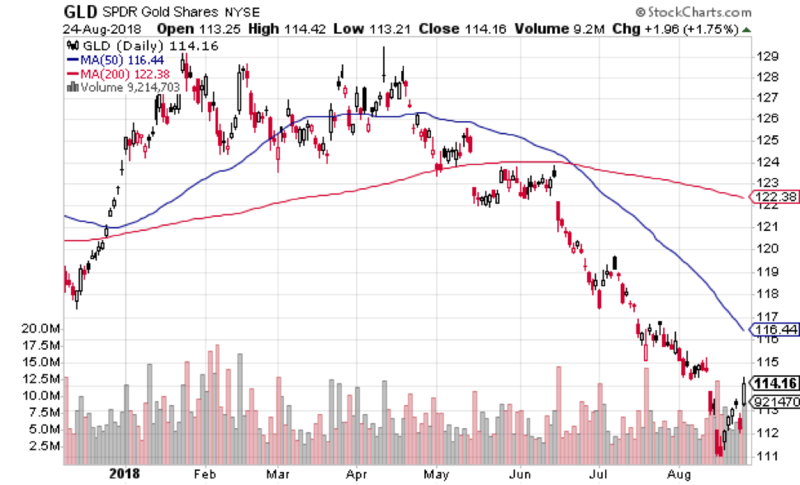 The chart above shows the GLD exchange-traded fund, which is designed to mirror the price movements of gold. Gold hasn’t outperformed Apple and the U.S. dollar, like I predicted it would, but it sure-as-hell has outperformed bitcoin! And while I’m highly optimistic on gold’s prospects, especially given the supply issues recently highlighted by Rick Rule, I’m still bearish on crypto. Bitcoin and other cryptos have failed, at least thus far, every test of being money. Cryptos aren’t legitimate means of exchange – few people accept them and fees are high. Bitcoin and its ilk can’t be seen as stores of value, either, given their volatility and huge losses over the past three quarters. Hot money flowed into the space, igniting a digital-age Tulip Mania in 2017, but I doubt the investment public will ever be so foolhardy again. I think cryptos have topped, permanently, even as blockchain technology continues to look promising. Bitcoin Cash, the “hard-fork” bitcoin breakoff, has performed even worse than the original. Other formerly hot cryptos have also posted bigger losses than bitcoin proper, and the recent China trade-war dustup and Turkish turmoil have done little or nothing for bitcoin and its peers, either. I’ve said it before, and I’ll say it again: Bitcoin and other cryptos are not and can never be money. Only gold and silver can fulfill that role in a free market. Crytpos, at best, are a less-than-ideal workaround for the present-day system of fiat-money central banking. In the absence of fiat and legal-tender laws, gold and silver will resume their traditional roles. Who in their right mind would prefer 1s and 0s in the ether to a gold or silver coin in their hand? Indeed, since central banks and governments hold more gold now than they did when the world was officially on the gold standard, one could make an argument that gold is still what ultimately gives fiat currencies their value. Perhaps this is why the U.S. dollar has stood up better than bitcoin, which is backed by nothing but hope for a future that may never be. I’m still bullish on gold and silver, and I consider the multi-year bear market in precious metals to be perhaps the greatest buying opportunity of all time. Trade stocks and other paper assets if you are so inclined; invest in solid corporations with earnings and dividend growth; but save in real money – that’s gold and silver. J.D. Seagraves shares his exclusive insights and analysis in the Silver Monthly newsletter. Newsletter content isn’t published elsewhere and cannot be found online. The next issue will be published on Labor Day, September 3, because capitalists don’t have a holiday.